Welcome to our ocean paradise at the Kahana Outrigger. We take great pride in our island home and want to ensure you have everything you need for a very enjoyable and comfortable holiday. Our best advertising is the feedback from our guests - please do check out our "Traveler Reviews" on this site. We continue to upgrade our unit each year during our stays. Improvements on our last trip included a new dishwasher, microwave, stove (with two oven compartments), Trump king mattress for the master suite, new toilets, and all new window coverings (blinds). Other recent improvements include a new WIFI Internet connection, all new air conditioners in the bedrooms, a new ceiling fan in the living roon, four new flat screen TV's, a blu-ray DVD player, new washer and dryer, new furniture in the living room, dining room, and all three bedrooms, new lanai furniture and a new Sealy king mattress for the second master bedroom. We also added new bedspreads on all the beds, new small appliances (coffee maker, blender, kettle), new dishes, new cutlery and knives, a new high chair, boogie boards, and new sand toys (including a great dump truck!). We just finished a thorough fall cleaning and maintenance of the unit including bleaching all the kitchen drawers and cupboards, washing all the dishes, cleaning under all the beds, washing all the baseboards, and more. Stay tuned as we continue to maintain and upgrade our unit. We have also created our own little guide to Maui that we provide to all our guests that provides information on everyday questions such as where to buy groceries, locations of great nearby beaches and boogie board spots, good local restuarants, etc. 1. The condo is right on the ocean with stunning, unobstructed views of the ocean and the neighbouring islands of Lanai and Molokai. 2. We are on the ground level with easy access to the beach and the pool. We are only a seashell's throw from the water. 3. The condo is over 1,450 sq. ft. - big enough to give everyone their own space. 4. There are 3 bedrooms and 3 bathrooms - great for multiple families, extended families, and friend get-aways. 5. There is a tub, washer/dryer, a high chair, a Pack 'n Play, a stroller and sand toys in the unit, handy for families with young kids. 6. In addition to the very private beach at your door step, you have your pick of some of the best beaches on Maui. Kahana Beach is just one block from our front door and offers great swimming for the entire family. Napili Bay Beach is just a few minutes north and has some of the best snorkeling conditions on the west side. Just beyond Napili is the famous Kapalua Bay Beach which has been rated the #1 Beach in American twice! Also minutes away are Flemings Beach, great for surfing and boogie boarding, and Honolua Bay, a natural marine life sanctuary. 7. Our Maui home is part of a low-rise, low density condo development with 4 buildings each containing 4 units (5 steps up). We are situated on a quiet street and are only minutes away from all the best island attractions, shopping, restaurants, and world class beaches! 8. It is not uncommon to wake up to morning rainbows over the water, witness visiting humpback whales breaching through the water (in season), or spot resident sea turtles lazily floating out in front of our grassy knoll all from the comfort of our lanai. Take advantage of the great rates now being offered and ask about our promotions! We welcome your visit and hope you will love your stay at our Maui home as much as we do! We live in Canada, but we LOVE the ocean and the beach. Ever since we honeymooned in Maui we've been going back to vacation as often as we can. As our family grew, we found Hawaii to be the perfect place to go - all the amenities of home (and then some), in the backdrop of one of the most beautiful tropical islands in the world. We just couldn't get enough of Maui and the ocean. The beach is so close you can throw a seashell from the lanai / deck and hit it. The ocean is so close you can throw a seashell from the lanai / deck and hit it. Our unit has one assigned parking spot. Additional cars can be parked in the visitor parking spots. New LCD TV and BluRay DVD in living room. All three bedrooms also have new flat panel LCD TV's. Great view. Great location. Very clean. Lots of whale citings. Amazing views. Saw too many whales to count. Great location. Very low key. Good pool. Snorkeling terrible at beach but less than 5 min drive to outstanding snorkeling. Great value. Sealions, Turtles and Beach. Oh may. It was a lovely place and location. Our favorite place in the world! 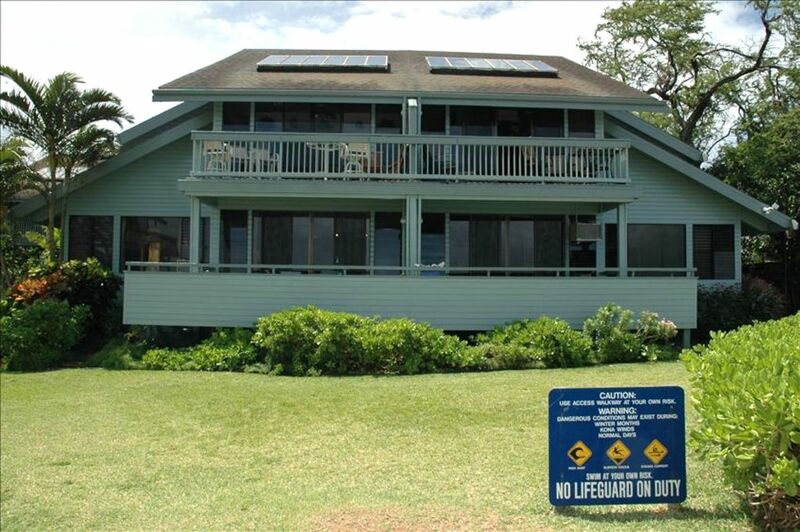 The location can't be beat: steps away from a beautiful, sandy beach … we had many whale viewings and stunning sunsets from our lanai … the sound of the surf so close … excellent views of Molokai and Lanai to the west. The condo is beautiful and spacious: it was my wife's 70th birthday, so we invited our two children and their spouses. Everyone loved having their own bathroom & bedroom. Decorations are tasteful and tropical. We made good use of the kitchen: double oven, stove, microwave, big fridge, plenty of cookware & cutlery. We really enjoy working with Randy, the owner … we stayed here 4 years ago for our 40th anniversary, and booked this condo a year ago to make sure we could get it again. Location, Location, Location! This is location is amazing. Beautiful view from the Lanai! steps to a beautiful sand beach. Beds and furniture very nice. A/C in each bedroom. Great Vacation! We wanted a 3 bedroom 3 bathroom for 5 adults and there were not very many in Kaanapali area. We also didn’t want a bong walk to a big parking lot and this is just right....only a ver short walk to the car. Parking was tight for our large Yukon van! The dining table for 6 was used a lot. The beach is small but so close! It was too cool for us to go in but others were paddle boarding and enjoying the water. No shampoo or other toiletries are supplied but hairdryers, dawn detergent, cleaning supplies, seran wrap, foil, ALL other utensils, Tupperware ,coffee maker, blenderetc were new and plentiful! Very well stocked overall. You should bring laundry pods to do washing of clothes. Chinese restaurant across the street and McDonslds a few blocks down. Great location. Happy with size of unit. Nice to walk directly out to beach. Can walk to store or snorkel rental. The oven dials are not visible, but there is a laminated copy of what they are so all cooking was fine. The middle bathroom toilet chain fell off and I repaired it easily but probably needs someone to crimp end of chain. Lanai is beautiful and there were 4 boogie boards available. Snorkeling guide book is in bookcase. Please look around because there are dvd’s In case. TV in small bedroom isn’t connected to cable fyi so just be aware. I used VRBO ap to message owner but didn’t receive any response. I didn’t turn ac on in front bedroom . Didn’t need it. Others in party had them on and they worked. Ceiling fan in dining area hums loudly so be aware. All other appliances were in good working order. Didn’t use pool, ocean was warmer. In addition to the very private beach at your door step, you have your pick of some of the best beaches on Maui. Napili Bay Beach is just a few minutes north of us and has some of the best snorkeling conditions on the west side. Just beyond Napili is the famous Kapalua Bay Beach which has been rated the #1 Beach in American twice! Also minutes away are Flemings Beach, great for surfing, and Honolulu Bay, a natural marine life sanctuary. Ask about our promotions! Hawaii State taxes of 13.42% (GET of 4.42% and TAT of 9.00%). Hawaii State Tax ID is W69297370-01 Late check out available for 50% of nightly rate. Rates are subject to change until reservation is confirmed.